He came from nowhere. Japan was expecting gold in wrestling, judo and women’s volleyball, but not boxing. Takao Sakurai (桜井 孝雄) won his first match in the bantamweight class against Brian Packer of Great Britain, but no one outside the Korakuen Ice Palace took notice. He won his second match with ease against Ghanian Cassis Aryee, but there was still no interest. But when Sakurai easily outpointed Romanian Nicolae Puiu, people finally began talking about the kid from Chiba. 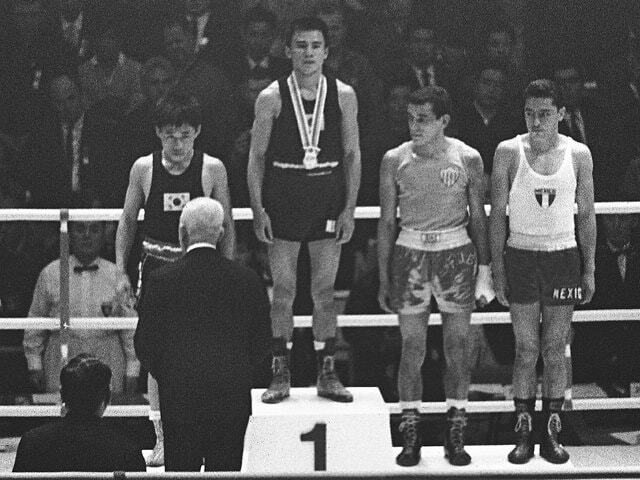 Japan experienced glory in boxing for the first time in Rome, when Kiyoshi Tanabe won bronze in the middleweight class. But when Sakurai defeated Washington Rodriguez of Uruguay, Japan had a boxer in an Olympic finals for the first time. His opponent in the finals was Chung Shin-Cho of South Korea. From the beginning, Sakurai peppered Chung with stinging right jabs and hammered with hard lefts throughout the contest. Chung went down three times before the referee stopped the fight at 1 minute 18 seconds of the second round. Takao Sakurai becomes the first Japanese to win gold in boxing, and remained the only one until Ryota Murata did so in London in 2012. Sakurai was perceived as a very cool competitor, sometimes overly so. When a reporter suggested it was surprising that Sakurai wasn’t brimming with tears of happiness after winning the gold, he replied, “I haven’t had any water to drink, so no tears to cry”. American lightweight gold medalist, Sam Mosberg, at the 1920 Antwerp Games was a spectator and was quoted as saying that Sakurai was the most outstanding boxer at the Tokyo Olympics. He was “very aggressive and willing to fight,” Mosberg was quoted as saying at the Hospitality Center of the Takashimaya Department Store. Why the 68-year old Olympian was interviewed at a department store, I have no idea. But finally, everybody knew who Takao Sakurai was. Watch this video on Sakurai. It’s in Japanese, but there’s plenty of boxing video from his bouts at the Tokyo Games. Posted in Boxing, Tokyo 1964 and tagged 1920 Olympics, 1960 Olympics, boxing, Kiyoshi Tanabe, Korakuen Ice Palace, Sam Mosberg, Takao Sakurai, tokyo olympics. Bookmark the permalink.